Salmon and Halibut fishing charter at it’s best! Located in Ucluelet, BC, Westcoast Fish Expeditions offers fishing charters in the heart of the best Salmon and Halibut saltwater fishing grounds available off Vancouver Island. The coastline between Ucluelet and Tofino is a feeding and spawning destination of some of the largest runs of Chinook and Coho salmon on the entire West Coast of North America, making it a hugely successful salmon fishing area and a great place for your fishing charters. Our Halibut grounds are renowned Worldwide as offering some of the best Halibut fishing experiences to be had anywhere. Our fishing charters cater to the novice and to the most ardent of anglers, who expect to be at the right place at the right time. Westcoast Fish Expeditions has been operating Salmon and Halibut Fishing Charters between Ucluelet and Tofino for over 20 years, and guarantees you the best service, and experience possible. Westcoast Fish Expeditions will help you experience some of the best fishing on the entire westcoast. 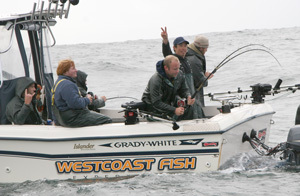 The key to our high success rate is Ucluelet’s location, experienced local guides and our quality boats and equipment. Ucluelet is surrounded by many different fisheries which provide us with the most consistent and reliable fishing on the coast throughout the entire year, making each trip a successful one. Westcoast Fish Expeditions has been running out of the Ucluelet and Barkley Sound area for over 20 years and has established itself as one of the premiere charter companies in the area. We pride ourselves in running high end boats such as the Grady Whites and having the best local guides and equipment available for our guests.